Former University of Hawaii player Jeff Ulbrich, a linebacker with the San Francisco 49ers, dropped back to pass yesterday during a Pro Bowl clinic for youths at Kapiolani Park. 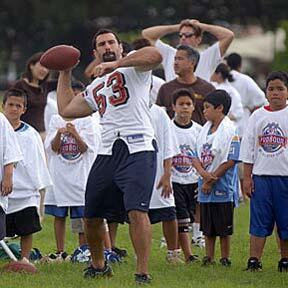 Other NFL players, including UH alumnus Wayne Hunter and Kahuku High School alumnus Chris Naeole, participated. The Pro Bowl is today. »Isle Grammy nominees splash around L.A.